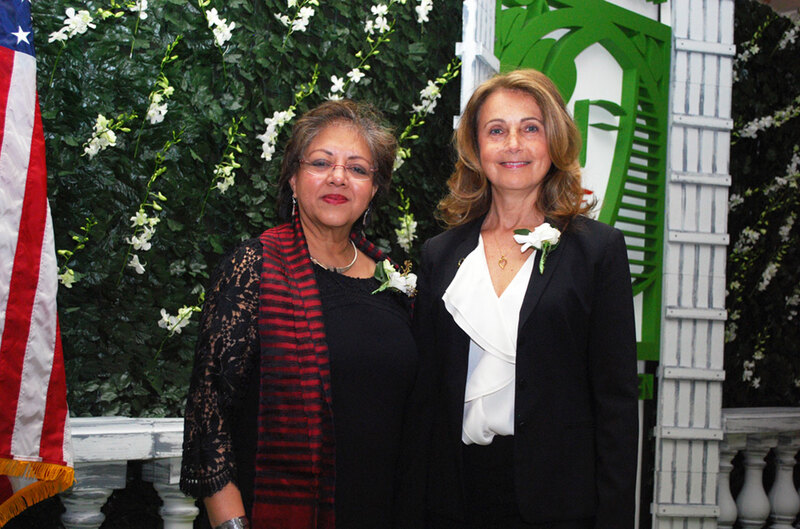 Two outstanding women at the University of Miami Miller School of Medicine were honored at the 31st annual “In the Company of Women” awards ceremony, which showcased the contributions of 15 local women leaders on March 7 at the Coral Gables Country Club. Ceremony emcee Victoria Galan with Shelly Baer, MSW, LCSW. Tatjana Rundek, M.D., Ph.D., was co-winner of the Outstanding Woman in Science and Technology award, and Rochelle A. 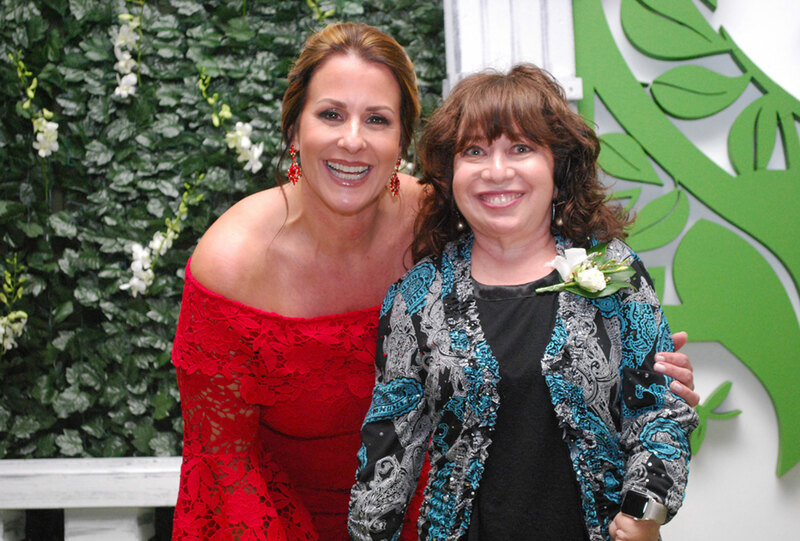 “Shelly” Baer, MSW, LCSW, received the Outstanding Woman in Health and Human Services award from the Miami-Dade County Parks, Recreation and Open Spaces Department, in partnership with the Parks Foundation of Miami-Dade and the Miami-Dade County Commission for Women. “I am so proud to be in the company of 15 amazing women who contribute so much to the well-being of our community,” said Dr. Rundek, a dedicated physician-scientist who is professor of neurology and public health sciences, executive vice chair for research and faculty affairs in the Department of Neurology, and scientific director of the Evelyn F. McKnight Brain Institute and the Evelyn F. McKnight Chair for Learning and Memory in Aging. The awards ceremony commemorates Women’s History Month in March and International Women’s Day on March 8. This year’s event also marks the 90th anniversary of the Miami-Dade Parks Department. An accomplished researcher with a strong commitment to clinical practice, education, and translation of research findings, Dr. Rundek serves on review study sections at the National Institutes of Health, the American Heart Association, and the American Academy of Neurology, and on the editorial boards of many scientific journals. She has more than 400 scholarly publications in the areas of genetic, epigenetic and environmental contributions to cerebral small vessel disease, stroke and cognitive decline, with a focus on health disparities in women and minority populations. Her research has informed clinical practice, such as through her efforts in developing and maintaining a stroke registry database for Florida and Puerto Rico, as well as in supporting more uniform standards for facilities that perform vascular testing nationally. She has also focused on underserved populations, including women and minorities, who have traditionally been understudied with respect to risk for chronic diseases, including stroke, cardiovascular disease and dementia. Ranu Jung, Ph.D., with Tatjana Rundek, M.D., Ph.D.
Dr. Rundek has been innovative in education and translation of research findings as well, currently serving as director of the Clinical Translational Research Division of the Department of Neurology. She has been a mentor to many junior researchers and clinicians. Dr. Rundek’s current investigations include the vascular mechanisms of successful aging, stroke, atherosclerosis, mild cognitive impairment and dementia, using magnetic resonance imaging and transcranial Doppler challenge testing. She has also co-authored recent publications demonstrating multiple health benefits of neighborhood greenness, such as tree canopies and parks, thereby supporting tree-planting efforts in Miami-Dade County. In receiving the award, Dr. Rundek thanked her team at the Miller School, citing Scott C. Brown, Ph.D., research assistant professor of public health sciences, who contributed to her work on identifying environmental factors affecting health and neurological disease. Dr. Rundek shared the science and technology award with Ranu Jung, Ph.D., the Wallace H. Coulter Eminent Scholar Chair in Biomedical Engineering at the Florida International University College of Engineering and Computing. A longtime educator and social worker, Baer, BA ’87, is passionate about challenging misconceptions sometimes associated with people with disabilities, especially women, and works to ensure that everyone is treated justly and equally. Diagnosed with juvenile rheumatoid arthritis at age three, she understood firsthand what it felt like to be treated differently because of a physical disability. As director of leadership training initiatives at the Mailman Center, she educates pediatric residents and trainees about the importance of understanding disability culture, health disparities, and the family perspective, including how to communicate with teenagers with disabilities about sexuality and dating. She also created ACCESS Miami, a local resource guide now under the auspices of the Mailman Center. Baer also oversees the curriculum for the center’s Emerging Transformation Leadership Program, which provides leadership training to early-to-mid-level career professionals seeking to create systems-level change in the diverse disability community. She also mentors young adults and high school students with disabilities in their personal advocacy and leadership projects through her involvement with the Leadership Education in Neurodevelopmental Disabilities (LEND), Self-Advocate Leadership Training (SALT), and Student Emerging Leaders Program (SELP). In addition, Baer has lent her expertise to numerous boards, such as the Center for Independent Living and the Miller School’s Office of Diversity and Multicultural Affairs. In 2011 she was invited to present on “The Beauty of Disability” for TEDxMiami, and in 2014 she launched the Bold Beauty Project, which uses photography as a venue to move policymakers to support people with disabilities and challenge concepts of beauty. The project showcases women with varying disabilities, of all ages, and from diverse ethnic and cultural backgrounds. It has been replicated in Washington, D.C., Philadelphia, and Texas.